The sale, through Ingles and Hayday, is expected to make £3,000-£5,000. 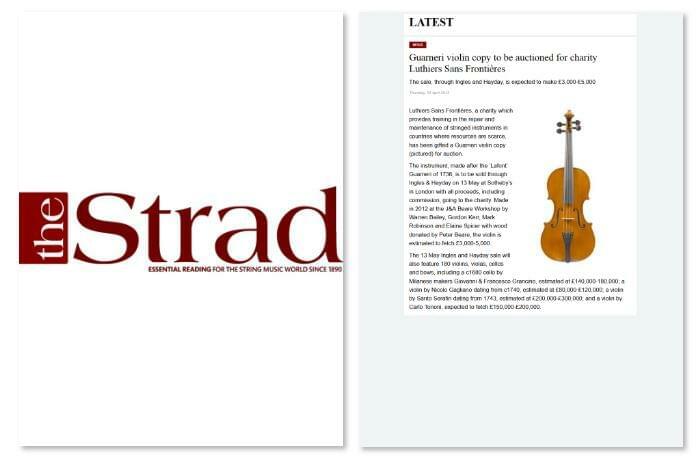 Luthiers Sans Frontières, a charity which provides training in the repair and maintenance of stringed instruments in countries where resources are scarce, has been gifted a Guarneri violin copy (pictured) for auction. The instrument, made after the ‘Lafont’ Guarneri of 1736, is to be sold through Ingles & Hayday on 13 May at Sotheby’s in London with all proceeds, including commission, going to the charity. Made in 2012 at the J&A Beare Workshop by Warren Bailey, Gordon Kerr, Mark Robinson and Elaine Spicer with wood donated by Peter Beare, the violin is estimated to fetch £3,000-5,000. The 13 May Ingles and Hayday sale will also feature 180 violins, violas, cellos and bows, including a c1680 cello by Milanese makers Giovanni & Francesco Grancino, estimated at £140,000-180,000; a violin by Nicolo Gagliano dating from c1740, estimated at £80,000-£120,000; a violin by Santo Serafin dating from 1743, estimated at £200,000-£300,000; and a violin by Carlo Tononi, expected to fetch £150,000-£200,000.